Welcome back! Can you believe we're at Part 4 of this article already? I've said it before, this all sounded so simple when I started! OK. Onward we go. Let's talk about wires and wiring. Basic. Run wires from Panels to Charger, from Charger to Batteries. While I have been known to cut the odd corner here and there, wiring should never be one of those corners. 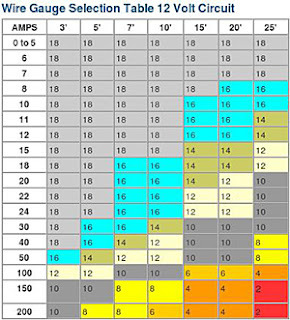 It is really important to select the right type and size (gauge) of wires for each wire run segment. 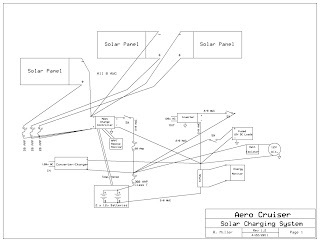 My install included connecting the Solar Panels, The MPPT Charge Controller, a large Inverter/Transfer Switch, several high amp switches, fuses for all lines, an Energy Monitoring system and a monitor/display for each device. As you can see, this is a bit complex to look at. If we look at each segment separately, it becomes MUCH easier to digest. Notice the heavier wires coming out of the fuse block. Since these were to be partially outside, on the roof, they needed to be well insulated against weather and UV rays to keep them healthy for the long haul. I ended up with 8 AWG dual conductor marine duplex wire. It wasn't the least expensive, but was the most durable and came in white so it wouldn't absorb as much heat as a a black sleeved version. Looking back, I seriously over-sized the wires. I had forgotten i needed to run 3 individual runs. One set of two wires from each panel to the Charge Controller. These needed to go across the roof in a few places then down into the fridge vent, to a fuse panel then into the controller. 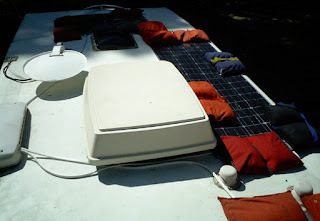 Each Solar Panel had a junction box with screw terminals inside and a water-proof, well I always say water-RESISTANT wire pass through on the outside. I stripped back the duplex sleeve and the individual conductor's insulation, started to pass them through the pass through.....and found out they weren't going to fit through. Oh, great. Now What? Did you ever hear that if something isn't working, force it? If it breaks it needed fixing anyway? No? Well with a judicious amount of force and much cursing I managed to force the wires through and screw on the clamping nut. FYI: Make sure you put the nut over the wire BEFORE you insert it into the junction box. Don't ask how I know that. So, now that we have the panels wired to the fuse block (1 fuse per panel) we have to wire the fuse block to the Charge Controller. I have 3 sets of positive and negative wires going IN to the fuse block and I wanted to have 2 (1 positive and 1 negative) coming out. This was easy. The fuse block gave me two large terminals to connect to and I used MUCH larger gauge wire to connect to the charge controller. The fuses are inline with the POSITIVE wiring from the panels and the NEGATIVE wires are tied together at a terminal on the fuse block. Since the wire run was very short (<1ft) I used some extra 2/0 AWG from the battery run. Why an MPPT Charge Controller? What the heck is it, what's it DO?!? Well, that's a good question. M.P.P.T stands for Maximum Power Point Tracking this is a fancy way of saying that it can figure out how many volts your panels are producing and convert it to more usable charging current (AMPS) when the Voltage exceeds what the battery needs to charge it. It's good for me, since I have panels that are around 36-44 Volts, I can start charging earlier in the day and longer into the afternoon/evening. Nothing is free, however, you cannot get more WATTS out of a panel than it will produce.At best, you can generate around 20% more charging during a given day. For me that was really important since I didn't have enough roof real estate to keep adding panels. So now we've got power to the controller! Yay! What are we going to do with it? In PART 5 we will talk about Inverters, transfer switches, battery wiring and making the system co-exist with what you have now. Everything has to play nice together! Read Part 6 of this series. Read Part 5 of this series. The continuing saga of a simple project... Well sort of! Having panels 3MM thin and light would make installation easy, shouldn't it? Sure it would. From the beginning I was always going to mount them to the roof using some kind of adhesive or silicone caulking. Now I had to figure out which one to use. Sounded like a simple bit of internet research. They say, "Murphy was an optimist," I couldn't agree more. The normal big box home store inventory didn't have something that would work over the long haul, in all sorts of weather and temperature extremes. I'll not go into detail here, but learning all about construction adhesives, elasticity, elongation, etc. Was NOT what I had in mind when I started this project. After calling various manufacturers I found the perfect stuff! It was strong, elastic enough to provide some shock resistance and had specs that met or exceeded every physical requirement for roof mounting the solar panels. of course, it was $12.00 a tube and I'd need at least 10 tubes. Ah well, nothing is perfect. After far too many rainy weekends a buddy and I began the process of adhering the panels to the roof. We test fit them and then taped off the size and shape of the panels on the roof. We then measured, test fit and ran the wires from where the controller would be to each of the three panels. Cleaning was next. Soap and water first, then alcohol to finish. 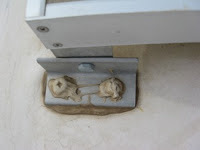 We applied the adhesive with a caulk gun and spread it thin with several wide scrapers. A uniform thickness would make life easier and minimize cleanup. Well, it should have! This stuff sets up FAST so cleaning up excess has to happen right away. Not to mention it gets all over everything including us. Make sure you have lots of alcohol (not the drinking kind!) for cleanup.The Sandbags (sometimes it's good to be a film maker!) came in handy to keep everything down until it cured. So far everything was looking good. then it began to rain, unexpectedly, a lot, for a long time. We covered the roof and everything on it with plastic and hoped the humidity wouldn't kill the adhesive job. In the mean time I went back to researching the best way to get the power to the batteries. I had decided on an M.P.P.T. 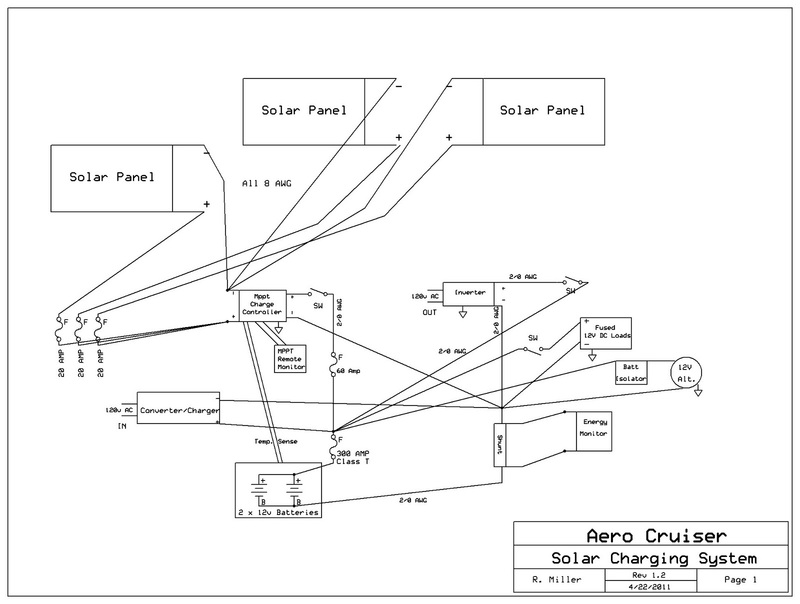 (we'll cover wiring and charging in PART 4) and was going to use the inverter that I had already purchased and installed to convert 12 Volt power to 120 Volt AC power. The trick was, how to wire this all together without frying all my wiring and becoming extra crispy in the process? Tune in next week when we'll look at how well and not so well that went! And...we're back! 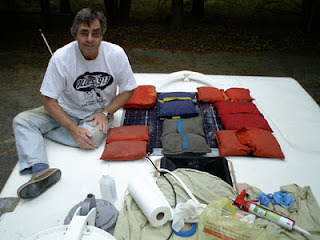 The last posting introduced my solar charging system and how false starts and misinformation can lead to inspiration. Now let's talk about the semi-flexible solar panels. Solar panels are, most commonly, aluminum framed, glass encased assemblies weighing around 30 lbs. They are usually mounted with "L" or "S" shaped brackets using holes drilled through the RV roof and then sealed. Some manufacturers and installers use what is essentially double-sided tape. Mind you, it's VERY strong tape, but still....tape. After I found out I couldn't really use any of the commonly available panels on my tiny roof and still have enough power to run everything I wanted for as long as I wanted, began searching high and low. I found a manufacturer in China that could (and would) make me almost any size I wanted in any voltage I wanted. Now all I needed to do was decide on the specs. Sounds easy?? I thought so. If you'll recall I needed at least 360 WATTS of panels to get the job done. I sent the measurements I had to the manufacturer and they sent me back some basic specs. Based upon the sizes I sent they configured 3 panels. 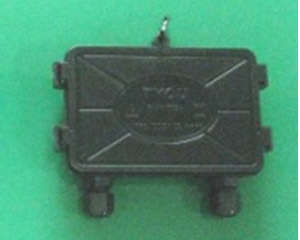 A 170 Watt version shown here and 2 140 Watt versions. 1 of the 140 Watt panels is the same width as the 170 Watt, and the other is almost square. Together they added up to 450 WATTS(!) given my limited roof real estate. I was thrilled, more than I needed and they only weighed between 5 and 8 lbs each! Since they are SEMI-flexible they would conform to the contours of my roof. Mostly. More on that later on. Let's look at maximizing efficiency for a moment. DC (Direct Current) systems can have lots of losses. The idea is to put as much back into your batteries as you can without losing it along the way. In order for a 12 Volt battery to charge you need to have MORE than 12 Volts. Imagine VOLTAGE is like water pressure in a pipe and AMPERAGE is the amount of water flowing. The Battery is like a water balloon you are filling. You need to have more pressure going into the balloon than the it has pushing back to get water to go in. A large quantity of water will fill the balloon faster. The longer the distance the water has to go the lower the pressure you have, so you get less water at the other end. Think of a long garden hose. At a lower pressure you can get a bigger hose to get the same flow. Ideally, you have enough Voltage to charge your battery and enough Amperage to fill it quickly. Now that we have that straight, back to Solar Panels. In order to make my system work efficiently I had to figure out how far my power had to travel and make sure my "pipes" (wires) were big enough to get the job done. If you've even done any work to the 12 Volt side of your RV you'll know that wires come in all sizes. From tiny wires going to gauge lighting, up to the heavy duty ones connected to your battery. The basic rule is, the higher the current (AMPS) the bigger the wire needs to be at 12 V. The longer the wire run, the thicker the wire. This will reduce losses. However, you can easily get to the point that the wires are WAY too big to be used easily. The fix is simple. Raise the Voltage! Higher voltages lose less with distance. Now my 18 Volt panels were beginning to look wimpy, especially since I had to travel 14 Feet from one of them to the charger. (We'll get into wiring and cable types in PART 3) It was looking like I would be better off with higher Voltage panels. I checked with the manufacturer and found I could spec almost any reasonable Voltage. After some research into the Charge controllers I found that I could comfortably use 36 Volt panels. In fact I would derive some side benefits from this....we'll talk about charge controllers and MPPT later on. So now I was ready to order my custom panels. After trading some English language (mostly!) e-mails with the manufacturer I negotiated a sample price of around $3.10/Watt. You can get better deals now, but that included DHL shipping from China. Tune in Next Week for PART 3 where we will talk about mounting the panels and dealing with wire runs. How do monsoon rains figure into a "simple" solar installation? On my quest to be as close to self sufficient as possible, one of the many things I wanted to do was become an "off the grid," no generator use kind of guy. When I first started looking into HOW to do that, it became obvious that I had a lot of learning to do before I could even begin an install or even purchase the system I needed. Research! As always is the first order of business. I figured a good place to start would be the roof. 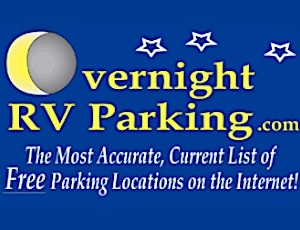 After all, my RV is very compact and that means severely limited roof real estate. As you can see, I had very few choices for panel placement based on all the "stuff" already up there. After figuring out the sizes I began looking for panels that would fit. This is where it got frustrating. It seems that there were VERY few panels that could meet the narrow width I needed. I searched and called around for months trying to find something that would fit the limited space AND provide the minimum I needed to meet my electrical load demands. I had to figure out how much power I use on an average day. I added up all my electrical needs (and wants) including, lights, water pump, furnace, A/C, microwave, computer, phone charger, appliances, and some miscellaneous items. Right away I discovered I would need an inverter to power the AC 120v devices from the batteries. We'll cover that more in depth in a later section of this multi-part article. Then I found out that I would not really be able to run the roof A/C on solar power for long enough to make a difference, so that was out. I discovered and added in all the little parasitic 12V loads I had. Things like the CO detector, stereo memory, etc. So, having figured out I needed between 80 and 100 amp-hours per 24 hour cycle it was relatively easy to find a formula online to calculate what I needed in WATTS. Bear in mind my worst day estimate was 4 hours of sun per day in winter. You get MANY more hours of sunlight in the summer. If I use 100 amp-hours at 12 V I need to have at least 25 amps generated over 4 hours of sunlight. (4x25=100) If you multiply 25 AMPS times 12 VOLTS you get 300 WATTS. (W=A*V) Figuring in losses due to cable length and de-rating the panels' output so we'd have a healthy safety margin I added 20% more (60 WATTS). I KNOW this isn't exact, but it was fine for figuring out if I could even produce enough power from the roof space I had. Batteries. I have 2 115Ah lead acid batteries in a small drawer under the RV. They give me 230Ahs to play with. You aren't supposed to use more than 50% of the battery capacity of wet cell lead-acids to extend their lifespan so I really only have 115Ahrs to play with. Sheesh. It all seemed overly complicated, but it works out, I promise. Finally, I was able to look into panels that would fit AND give me the WATTS I needed to charge my batteries fully each day, with some extra left over. There simply wasn't anything available that would fit the limited space I had. You know, if you look hard enough you can find almost anything on the Internet. I found some bleeding edge technology that would work. They are semi-flexible, aluminum backed, mono-crystalline highly efficient panels that I could get manufactured in almost ANY size I needed. Eureka! The only trouble was they were only made in China by a few manufacturers. So I spent a couple of months corresponding with various China based factories figuring out who made the best product and was the easiest to deal with. 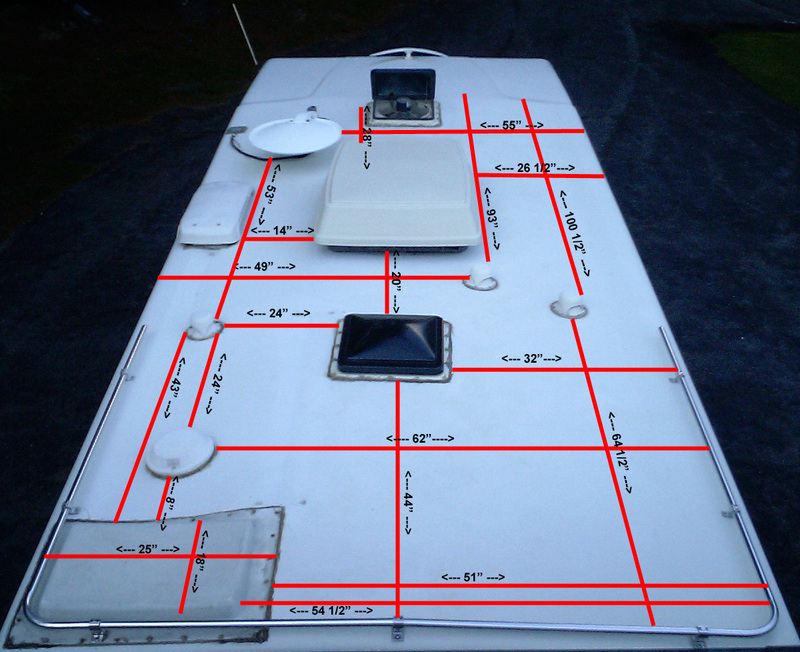 We worked on size, number of panels, panel voltage, and how to get them to the United States. In PART 2 of this article, we'll look at these choosing the specs for these panels, choosing a Solar Charge Controller, how to get them to stay on the roof and how to wire the whole thing up without melting anything important. Welcome to my little corner of the internet. I’ll be writing about a variety of RV topics, from adventures and misadventures to improvements and bleeding edge technology for our rigs we’ll explore it all. First, a bit of history; over the last 3 years I’ve purchased, restored and modified an "Orphan" Class A RV. Namely a 1991 Gardner Pacific Aero Cruiser 23RBa. 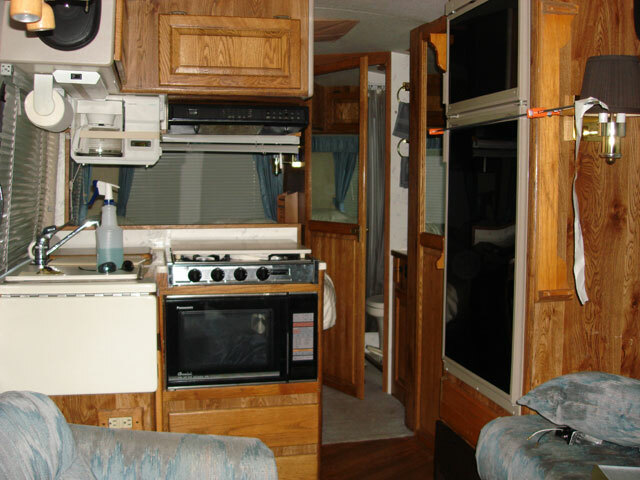 There weren't all that many produced between 1989 and 1992 of this compact, low profile (23’8” length - 99” height) coach. I’ll be sharing my trials and errors from these and the many more mods I have planned. My goal is to find trips to offbeat destinations. My last one was to an air show in Virginia where a friend and I supplied security overnight to several dozen WW2 planes and some vintage military jets. 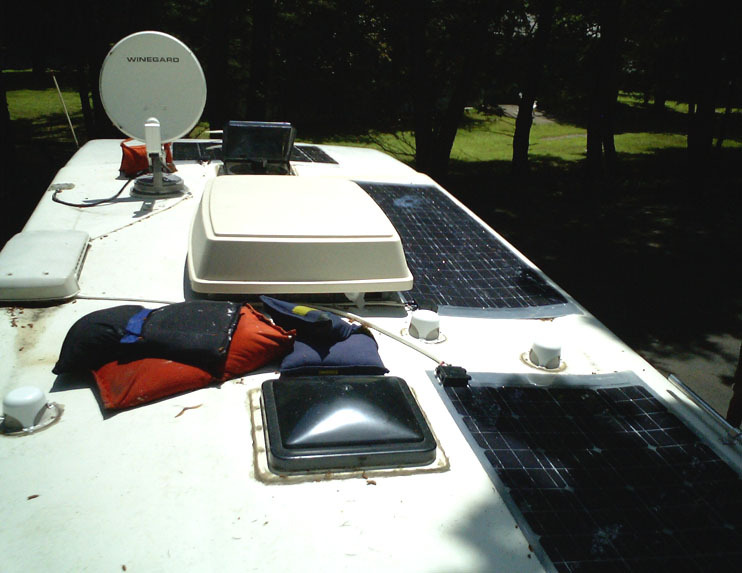 Some of the latest changes to the RV included designing and having manufactured the 3mm thick semi-flexible Solar panels and all the associated hardware. This past month I completely rebuilt and improved the stock suspension to allow for additional ground clearance and handling improvements. Yes, it is a tinkerer's dream. Perhaps next I will look into an engine swap to newer technology to increase my already decent MPG. Who knows?!? A bit of background, my name is Richard Miller and I have been RV'ing on and off for 15 years. I finally decided that it was time to spend more time on the road than at home in the stick built house. Unfortunately, I am not retired so this dream has morphed into having a way to escape at a moment’s notice any time I can string together a few days or more. I live in New York City three days a week and Upstate NY the balance, with trips to various locales spread out over the year. I keep the RV ready to go. No reservations, no plan….just go. So far it's working for me. Varied interests make for an interesting life. I have been and for the most part still am active in film/TV producing, law enforcement and the commercial orbital space industry. I am a commercial helicopter and fixed wing pilot. I SCUBA dive. I enjoy tinkering with motorcycles, hovercraft and anything else I can get my hands on! I have been working with computers since they used punch cards. Yes, I still even use Unix (Telnet for e-mail!) My coach is setup to have mobile broadband, satellite TV and on the go digitally stored video content.